9 to 11 days is always considered as a good enough time for a trip to Ladakh. For people flying into Leh City, it allows ample time for sightseeing but in terms of a road trip, it may very well be called as minimum time required. 11 days is in fact the most common time that I have come across to with people visiting Ladakh. It will ensure that you are able to cover all major tourist areas without traveling too much on any given day. How can you best plan your Ladakh itinerary for 11 days to ensure that you cover as much as you can and make the most out of your time is what I will be talking about in this post. In case you did not know, Ladakh happens to be the second largest district in India; after Kutch in Gujarat. Put this together with Manali Leh and Srinagar Leh highways (both of which are about 500 kilometers long) and you have a fairly huge area to cover in a matter of 11 days. The entire journey will present you with astounding sights at every turn of the road. On top of it the list of tourist attractions or places to visit too is quite enormous. How do you squeeze it all in a limited time frame thus can be a bit tricky but hopefully after reading this article, you will have an idea on how to do it. Like previous itinerary articles, in this one too, I will present three different set of itineraries. First one for people traveling by their own vehicle; second for people traveling by public transport; and third for people catching a flight to Ladakh. For the sake of this article, I will assume that you are starting your trip from Delhi. If you were however coming from a different city, then only the journey for first and last day is going to be different. Rest of the details for rest of the days will still apply. I will first suggest and itinerary that I recommend; follow by a few alternate versions of the same journey. Before I go on detailing the itinerary above, let me first explain why I am recommending traveling this way. Most of the people would prefer to reach Ladakh via Manali and come back via Srinagar. Even I did that the first time I went to Ladakh. But now, after being there a few times and per the recent conditions, I would recommend that you take the Srinagar route to get to Leh; and come back via Manali. Below is why. Also known as altitude sickness; or simply as AMS in short; Acute Mountain Sickness is the first thing that people worry about while going to Ladakh. Slow gain in altitude and plenty of rest is the key towards avoiding AMS which doesn’t really happen in case of Manali Leh route. Out here, elevation rises tremendously and a bit too fast for our bodies to handle. One day you are at home in plains reaching Manali by evening; and the very next day you climb up to Rohtang at almost 4,000 meters. This is the reason why most of the people going to Ladakh via Manali end up suffering from mountain sickness at either Sarchu, Pang or at any of the high altitude passes on the way. On the other hand, if you went via Srinagar, the the rise in altitude is a little more relaxed and allows more time for our bodies to acclimatize. If you were traveling with your family, I will highly recommend taking the Srinagar route to approach Ladakh. If you wanted to go to Ladakh from Manali, you will of course have to cross over Rohtang Pass. In order to cross Rohtang, you will first have to get a permit either online or from DM office Manali. This permit is limited in number and has a maximum per day cap. Then there is also the fact that the number of tourists visiting Manali and Rohtang rises each year. Due to all these factors, getting this permit is either a hassle or waste of time in Manali. Why? Because it gets sold out fast. During peak tourist season, the online window remains open just for a short while; and mostly the permits remain sold out for days in advance. If you wanted to try getting it in person, then it would mean wasting an entire day in Manali. Either way you look at it, it just means another task that you will need to get taken care of before your trip. Fun factor is that the permit is needed only if climb Rohtang from Manali side. It is not required if you were coming from the other side of the pass and climbing down to Manali. So taking the Srinagar Highway first means that you came back via Manali and hence the entire hassle of Rohtang permit would null and void. For more details on this permit, read How to Obtain a Permit for Rohtang Pass. After the introduction of Rohtang Permit, a check post was also set up at Gulaba where you are required to submit your pass before proceeding further. Average wait time at this check post can be as much as 2 to 3 hours. Number of tourists traveling on this road too is increasing each year due to which, even after you get past the check post; you can still run into a traffic jam on the 50 kilometers long stretch between Manali and Rohtang top. This is another situation that can be avoided by using Srinagar route to reach Ladakh. Fuel was a problem during Ladakh trip until 5 years ago but not anymore really. Agreed that the petrol pump in the entire district is still limited to just the one in Leh city but after the recent boom in tourism here, the locals have started to sell it in black at an increased price. You can find Petrol and Diesel at the local small shops and chadar tents for as much as Rs. 120 to Rs. 130 per liter. Quality of this fuel too is however questionable. So if you can manage to bring enough fuel that can last you from one gas station to another; then please carry some in spare. If not then you have no other choice but to buy from the locals in black. For more details, please read Fuel During Ladakh Trip – How to Manage. If you can, then add another day to the trip as buffer. The itinerary I suggested above is for 11 days but when you plan the trip, do it in a manner that if you had to extend the journey by a day more, you can afford to do so. There will be always an uncertainty factor during Ladakh trip and you may be forced to stay at any of the places en route if the road ahead was blocked. If all went well, then you will return home on Day 11. If not then at least you would be prepared for it. Now getting back to our itinerary, let me give a day by day run down of the journey. Roads are mostly good with a few bad patches between Pathankot and Jammu. There are a lot of places to see on this stretch including Magnetic Hill, Gurudwara Patthar Sahib, Mulbekh Maitreya, Indus Zanskar Confluence etc. For more details read What to See on Srinagar Leh Highway – A Complete List. Better to book in advance during peak tourist season. You may also first want to take a detour to Panamik from Khalsar before proceeding to Pangong. Journey back to Leh today but via a different route. From Pangong, drive back to Durbuk and take the road towards Chang La. Road is mostly good with a really bad patch around Chang La top. Also read How to Plan a Journey on Manali Leh highway. Travel time from Rohtang top to Manali itself is about 3 hours. If you are able to add just one more day to the trip then you will be able to cover a lot more. 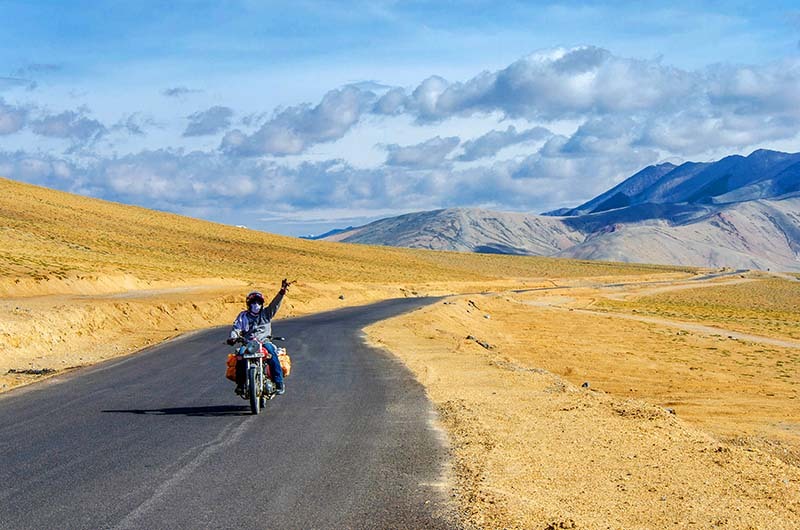 From Pangong, on Day 8, you can go straight to Hanle and reach Tso Moriri (Karzok) on Day 9. From Karzok then, you will travel to Pang or Sarchu on Day 10, to Manali on Day 11 and Delhi on Day 12. Thus, with just an addition of 1 day, you will be able to cover the entire Changthang Valley, Hanle, Tso Moriri and More plains. And this is it. That is your entire trip of 11 days to the mystic lands of Ladakh. The journey above however is best suitable for someone traveling by their own vehicle. If you were intending to go by public transport, then you should rather plan like the one below. Public transport in the itinerary below is in the form of both a bus and shared taxi. After the recent increase in tourism, finding a shared cab is not going to be that tough. All that you need to do is reach main bus stand in Ladakh. Even if there is no bus available, there will definitely be a shared cab. Traveling by public transport, it is better to go via Manali rather than Srinagar. You will go from Manali side and return the same way because it is easier like this; and also the fact that you do not really have the time to incorporate Srinagar route in this trip. You will first board a bus from Delhi to Manali. Next day, an HRTC bus start from Manali bus stand in the morning which reaches Ladakh in 2 days with a night stay at Keylong. This is the one you will need to catch. You will also be using the same bus for returning to Manali after staying at Keylong again. For visiting Diskit and Pangong, you can either look for a shared cab or bus from Leh bus stand. Last year, a same day bus to Ladakh from Manali was started. I am not really sure how it is going to be this year but if this service continues, then you can plan your journey like below. This bus starts from Manali at 4 AM and reaches Leh at around 9 – 10 PM. The same way, it starts from Leh early at 4 AM and reaches Manali by late night. As I said, this was a new service that started in 2018 and I am not sure how it will continue in the coming years. But assuming that it remains the same, your itinerary can be like below. The reason why you keep coming back to Leh from Nubra, Pangong and Moriri is because there is no public transport available on the direct routes between the see places. Your bus that brought you to all these places goes back to Leh the next day and that is your only option really. Now since we are talking about Manali to Manali and keeping Srinagar side out, let me also tell you how you can do so if you went by your own car or motorcycle. If you were flying into Leh City and had the entire 11 days to spend in Ladakh itself, then you can plan your itinerary like below. If you were eager on starting your trip from Manali and return via Srinagar then the itinerary can be like below. The plan below is assuming that you were able to arrange your Rohtang Permit in advance online; or by either contacting a travel agent; or a hotel in Manali. The examples above are just a few of numerous other ways that this journey can be completed in. 11 Days is sufficient time for your to explore and visit almost all the major tourist attractions. I hope the information above on Leh Ladakh Itinerary for 11 Days was of help. If you have any other questions; or need any further details; please feel free to ask in the comments section below; or at our Community Forum; and I will be glad to answer.